For those who don’t know it, Jacaranda Ibiza is a sprawling white haven atop the beach in Es Canar. 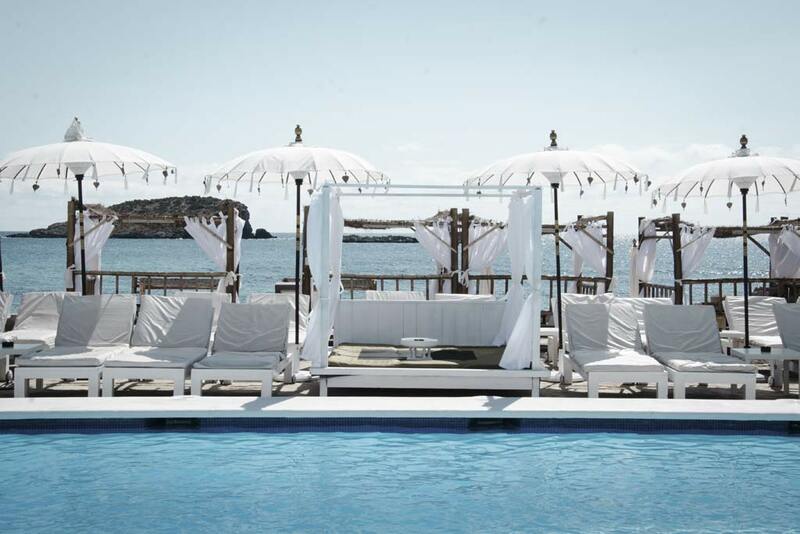 Stylishly fitted out in Asian influenced white Bali beds, thatched cabanas, sunbeds and pristine white tables and chairs, dominated by an azure blue pool overlooking the glittering Mediterranean sea. It is a stunning venue, popular with locals and tourists alike, and one of the islands go-to destinations for weddings and events (ever-friendly owner Mandy Hayes was telling me how this year is their busiest yet with weddings). Add to this delicious food, amazing signature cocktails and relaxing shisha pipes. 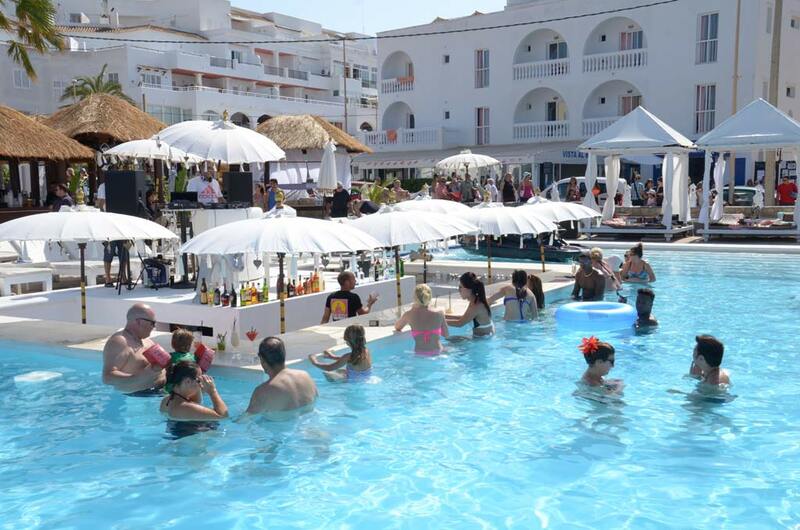 This year they have upped their game even more, boasting a varied schedule of events with something different every night as well as being open for food, pool fun, relaxation and cocktails all day every day. Monday nights are Fire and Ice, featuring DJ’s, dancers and spectacular fire shows. On Tuesdays it’s a chill out day; relax and unwind by the pool, take in the sunset and enjoy cocktails, food and tranquillity. 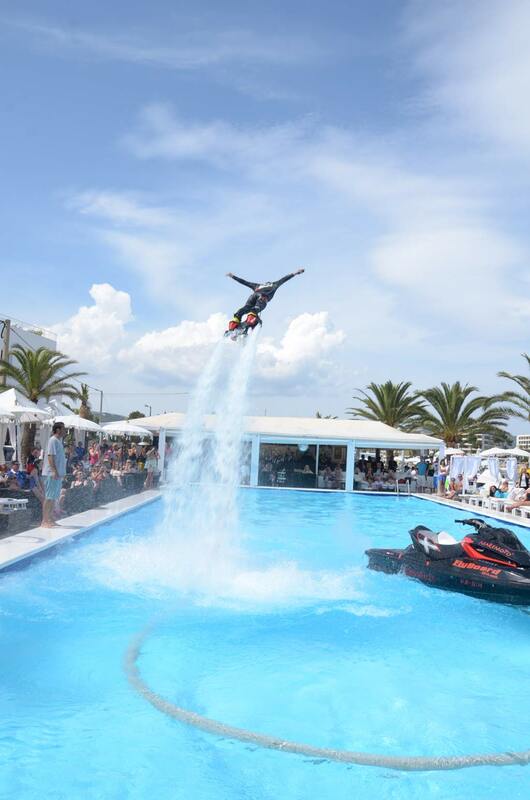 Wednesdays are McQueen nights, this is one not to be missed, with the huge pool playing host to breath-taking fly board shows by Lyndsey McQueen. Combining lights, music, acrobatics and jaw dropping fly board tricks, this is a spectacle like no other. Thursday is Blues in the Night, an evening of blues music under the stars. Fridays are Jungle nights featuring resident DJ Rick Live, fire shows and animals – go down and meet a python! Saturdays are big party days at Jacaranda, with the daytime Bikini Party featuring Jacaranda resident DJ’s Rick Live and Ibiza Global’s Jamie Porteous. Followed by a night time Circus party with acrobats, stilt walkers, balancing acts, jugglers, dancers and more! Sunday night is Celebrity Sundays, featuring live performances by big names from the UK are one of the big highlights at Jacaranda Ibiza. There’s also a Silent Disco from midnight every Wednesday and Sunday, allowing you to keep dancing into the wee hours without disturbing the neighbours. The newly installed big screens provide a great view of the stage wherever you may be and sound is rigged to be heard from anywhere in the venue, so there’s no need to leave the comfort of your Bali bed, perch at the bar or dining table to enjoy the shows. What’s more, all of the events are free and every night there’s a four or five hour ‘happy hour’ with great drinks promos. There aren’t many places I can think of on the island where I can dance to my favourite house music with my three year old, let alone lay her down on a ‘VIP’ bed next to the dancefloor when she gets tired and be brought a blanket for her instead of being told I have to pay for the use of the bed. On an island which sometimes feels like it’s becoming too exclusive for it’s own good, Jacaranda remains a friendly and inclusive venue that has the look of a high end beach club but none of the snobby attitude. Jacaranda welcomes everyone, regardless of age, nationality or anything else, to join the fun and encourages a happy and familial atmosphere, and that’s a real testament to Mandy and her staff.